Cat Collar , Safety Stretch Reflective Cat Collars with Bell-3/8"-Hi-Light International Inc.
All elastic, stretchy woven nylon for safety feature. 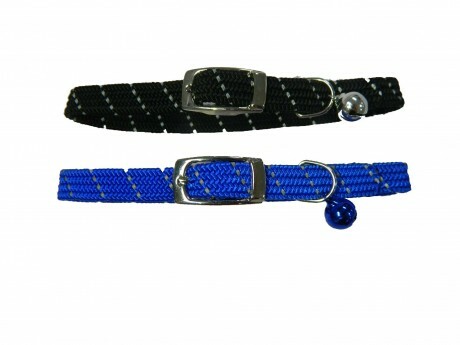 Stretch Weave design helps to release pet collar from your cat's neck be caught in or on an object. No buckle holes, Completely adjustable. You can buckle anywhere safety stretch cat collars and adjust to fit any size cat neck in the range.